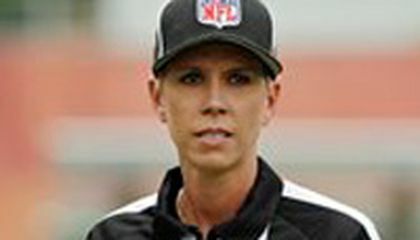 Sarah Thomas, who has worked exhibition games, will be a line judge for the 2015 season, the league announced. The 41-year-old Thomas was in the league's officiating development program in 2013 and 2014. She worked some team minicamps last year. She's already broken ground in the officiating field. She was the first woman to work college games, in 2007. She was the first female official on the FBS level. She was also the first to officiate a bowl game. That was the 2009 Little Caesars Pizza Bowl in Detroit. The FBS is the highest level for college football. "I am a female. But I don't look at myself as just a female," Thomas said last June while working a Cleveland Browns minicamp. "I look at myself as an official." Shannon Eastin worked regular-season NFL games in 2012. She was a replacement official, making her the first woman to do so in any capacity. She also was a line judge, which makes many calls, including offsides and the placement of the ball following a play. Thomas is a former college basketball player. She was inspired to become an official in the 1990s. She attended a meeting of officials with her brother, Lea. In 1996, Thomas became the first woman to officiate in a Division 1-A high school football game in Mississippi. Just under a decade later, she began officiating college games. She was hired by Conference USA. There, she worked as a line judge and head linesman. She also has worked the Senior Bowl, the Fight Hunger Bowl, the Medal of Honor Bowl and the Conference USA championship game in 2010 and 2014. Thomas officiated two seasons in the United Football League. It is now out of business. I think that this is really cool. Most people think of football as something only guys would enjoy or only that guys can reff. Sarah probably has more college experience because it's easier to get a job of reffing college football than professional. I think they should continue to hire women to reff because it shows that people of both genders can do whatever they want as a job. I think Sarah Thomas has more experience at college football than professional football because she started with college football and worked her way up to professional. She did college football in 2007. She also did FBS level. Sarah Thomas has experience at college level because she was coaching a college football team. Why I think that because she has only been an official for college football games. 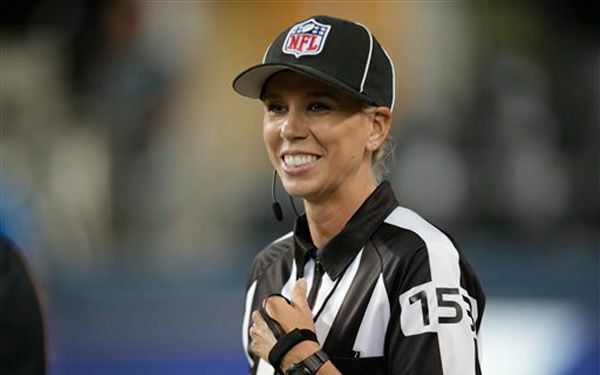 Another reason is that she has only been a official for only 2 NFL games. Also she has been a coach for a college football game. Last, she is now been being an official ever since. Sarah Thomas has more than a college level then the professional level because she is only college trained . 1. she was taught basketball for college. 2. She is a coach basketball. 3.she coaches basketball for people. Sarah Thomas has more experience at the college level than the professional level because she just started the professional level this year. Also because she started the college level in 2007. Another reason why she has better experience because when she was doing college she was head linesman. Something else is that when she started professional level she was only line judge not head linesmen. These are the reasons why she has more experience in college level than professional level. Why Sarah Thomas have more experience with college level then professional level because she has been working on college food ball for the past few years. Why Sarah Thomas have more experience with college level then professional level because professional dose not really let girls be a judge. Why Sarah Thomas have more experience with college level then professional level because Sarah had to start from a low level so she could get some experience. Why Sarah Thomas have more experience with college level then professional level because college foot ball gave her a chance to work there. That was Why Sarah Thomas have more experience with college level then professional level. The reasons why Sarah Thomas have more experience at the college level than the professional level is because of these three reasons. First, she stared in college so she no the college way better. Next, she knows the college rules better. Last, she can hang with her friends there it be faster to get to know them. That is how Sarah Thomas have more experience at the college level than the professional level. She is more experience in college because she has play more in college. I know this because it says it in the story. I also know this because I asked my dad and he said yes. Another reason I know this is because I read this before Mr. S assigned it to me. Sarah Thomas has more experience at college level than professional level because she had more time to practice in college and in the story it says she had only half of a year in professional level and 4 years of college level. I said that because it said that in the middle of the paragraph and it is like that in real life to. Sarah Thomas has more experience at the college level than the professional level. She has more because collage football is easier to keep track of. She also has more because collage is easy to keep track of. And also She has more because professional Is hard to keep track of. That is why collage is easier.